The weather in Colorado gets too cold to sustain an avocado tree in the landscape. Avocados are best suited to tropical and subtropical regions that do not experience killing frosts, according to the Texas A&M AgriLife Extension. Avocado trees can be grown in Colorado in containers and brought indoors during the winter. The University of New Hampshire Cooperative Extension notes that pits from Florida avocados germinate and grow faster than those from California. Remove the avocado meat and wash the pit with cool water. Allow it to dry for several days. Place three to four toothpicks equally spaced around the side of the avocado. Suspend the avocado over a glass or jar of water, with the pointed end up and water covering the bottom inch of the pit. Replenish the water as necessary until the avocado germinates and develops a root system. 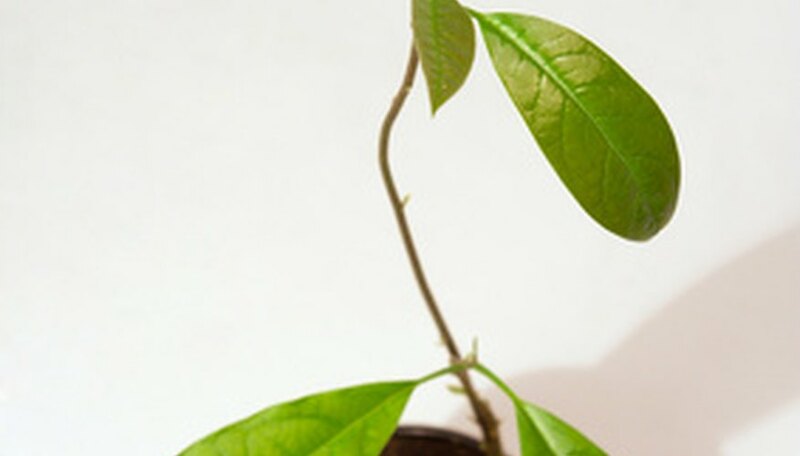 Plant the small avocado plant in a small pot filled with a mixture of potting mix and sand. Place the plant in the soil so that the top of the seed is just visible at the top of the soil. Water the avocado regularly to keep the soil moist. Allow the top inch of soil to dry out before watering. Watering may be needed daily during the hot days of summer and will be needed less often in the winter. Place the plant outdoors in a sheltered location or in a sunny window with filtered light during the summer and move to a location with full sun during the winter. Fertilize with a balanced water-soluble plant food according to the package directions. Prune the avocado tree twice during its early growth. When it reaches 6 to 7 inches tall, cut the stem back to 3 inches. Cut it again when it reaches 12 inches in height, back to 6 inches. This encourages branching and new growth. Repot the tree into a larger container in the spring and whenever the plant becomes root-bound. Choose a large container with wheels or place it on a plant dolly for easy moving at the beginning and end of the season. Avocado trees can take as long as 15 years to produce fruit. Trees grown from seed may not produce true to variety.